A new Chandra study indicates the existence of a population of black holes that is consuming extremely large amounts of material. Thick, donut-shaped disks may be surrounding the black holes, blocking much of the light that would otherwise be emitted. The black holes in these quasars may be growing at an extraordinarily rapid rate. 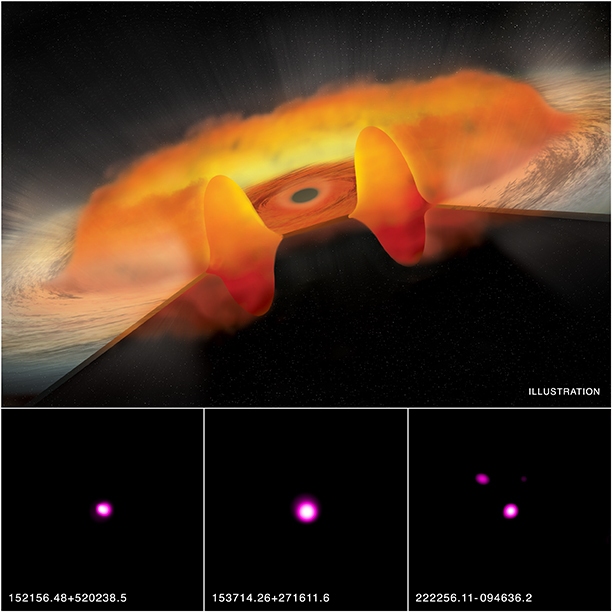 Astronomers have studied 51 quasars with NASA's Chandra X-ray Observatory and found they may represent an unusual population of black holes that consume excessive amounts of matter, as described in our latest press release. Quasars are objects that have supermassive black holes that also shine very brightly in different types of light. By examining the X-ray properties with Chandra, and combining them with data from ultraviolet and visible light observations, scientists are trying to determine exactly how these large black holes grow so quickly in the early Universe. The quasars in this study - including the three shown as Chandra images in the bottom of the graphic - are located between about 5 billion and 11.5 billion light years from Earth. These quasars were selected because they had unusually weak emission from certain atoms, especially carbon, at ultraviolet wavelengths. Also, about 65% of the quasars in this new study were found to be much fainter in X-rays, by about 40 times on average, than typical quasars. The weak ultraviolet atomic emission and X-ray fluxes from these objects could be an important clue to the question of how a supermassive black hole pulls in matter. Computer simulations show that, at low inflow rates, matter swirls toward the black hole in a thin disk. However, if the rate of inflow is high, the disk can puff up dramatically into a torus or donut that surrounds the inner part of the disk. This is shown in the artist's illustration in the top part of the main graphic. X-rays, produced in the white region very near to the black hole, are substantially blocked by the thick, donut-shaped part of the disk, making the quasar unusually faint in X-rays. The X-rays are also prevented from striking the particles that are being blown away from the outer parts of the disk in a wind. This results in fainter ultraviolet emission from elements like carbon. A paper describing these results appears in an upcoming issue of The Astrophysical Journal and is available online. The authors are Bin Luo (Penn State University), Niel Brandt (Penn State), Patrick Hall (York University), Jianfeng Wu (Harvard-Smithsonian Center for Astrophysics), Scott Anderson (University of Washington), Gordon Garmire (Penn State), Robert Gibson (University of Washington), Richard Plotkin (University of Michigan), Gordon Richards (Drexel University), Don Schneider (Penn State), Ohad Shemmer (University of North Texas), and Yue Shen (Carnegie Observatories). Coordinates (J2000) RA 15h 21m 56.50s | Dec +52° 02´ 38.50"
Coordinates (J2000) RA 15h 37m 14.30s | Dec +27° 16´ 11.60"
Coordinates (J2000) RA 22h 22m 56.10s | Dec -09° 46´ 36.20"